© Medeshi News: Can Somalia regain control and management of its airspace soon? Part I. Can Somalia regain control and management of its airspace soon? Part I. Since 2010, Somalia’s airspace has been an issue between the successive governments of Somalia and the International Civil Aviation Organization (ICAO), which currently manages the airspace on behalf of Somalia. The subject was and still is a controversial topic for discussion among Somalians in Somalia and diaspora alike. The Somali state has made several unsuccessful attempts to regain control and management of its airspace. 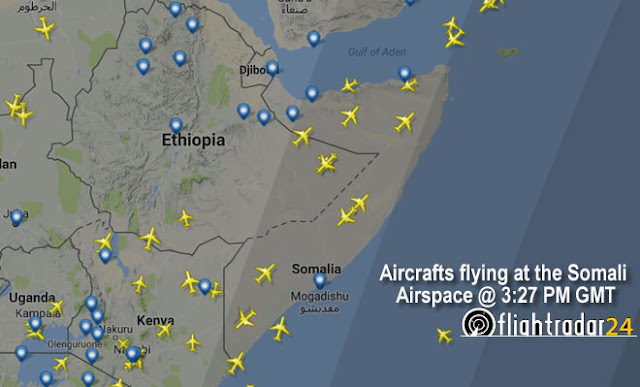 ICAO is thus reluctant to hand responsibility of the airspace over to Somalia. It seems that ICAO has no confidence in the ability and capability of Somalia to safely manage its own airspace. Outside of the Somali government and ICAO, the Somali citizens may not necessarily know the details of the conflict because the situation is difficult to understand and not much information available to the public. But they are certainly frustrated with the way that foreign parties are managing the country’s airspace and collecting its revenues. Firstly, I should make clear what international aviation law is and how it works. Somalia, as a sovereign state, has exclusive sovereign right to its airspace. The issue of airspace sovereignty can be traced back to the early years of air transport industry developments. Immediately after World War I, the majority of military aircrafts were been converted into civilian ones, and as a result, the international air transportation grew rapidly. There was a need to regulate aircraft movements, as they began flying into other states. Therefore, the recognition of states’ sovereignty over their airspace was discussed for the first time at the Paris Convention in 1919. The Convention laid down states’ principal rights in terms of the sovereignty of their airspace. However, at the Chicago Convention in 1944, the most famous aviation conference in history, the principles of absolute sovereignty were reinstated and reinforced. According to articles 1, 2, and 3 of the convention, the contracting states recognise that every state has complete and exclusive sovereignty over the air space above its territory. To clarify further, the territory of the state is the land area and territorial waters adjacent thereto under sovereignty, protection, or mandate of that state. So, no state aircraft of a contracting state shall fly over the territory of another state or its land without authorisation. Therefore, in order to enable aircrafts registered in one state to fly into other states, permission must be granted by the relevant state. The Convention agreed on what became known as the “freedoms of the air” or “traffic rights”, which are set of privilege rights that grant airlines permission to overfly or land in other state. Following the Chicago convention, each state has controlled and regulated its airspace according to these international air transport laws. Each country has the right to limit and control the number of airlines, size of aircrafts, cities to be served, and how many flights per day (frequency) may fly into their territory. This right is granted through what is known as the Bilateral Air Services Agreement, which an agreement between two governments in regards to air transport services. Somalia did not exist as an independent country at the time of the Chicago convention. However, after gaining its independence, the country has ratified the Chicago Convention treaty and is obliged to comply with all ICAO annexes in relation to safety, security, operational, and environmental aspects of its air transport industry. Following independence, Somalia has signed a number of bilateral air services agreements with other states. For example, in 1963 Somalia signed bilateral agreements with the former the Union of Soviet Socialist Republics (USSR) and Sultanate of Oman. These agreements enabled airlines registered in these countries to fly into Somalia’s airspace and land at its airports. Somalia as a sovereign state has exclusive sovereignty over its airspace, but what is the vertical boundary of the airspace? How high into the airspace Somalia can claim as its sovereign? The airspace boundary tends to be between 50 km and 100 km above the sea level, and more accurately up to 66,000 ft. This limit means that Somalia cannot claim territorial authority over outer space, which is the zone beyond the airspace surrounding the earth. Somalia, as well as all other states, has no control or sovereignty over the space beyond the boundary where satellites tend to orbit. What about Somalia`s territorial water boundary? Somalia’s territorial water, along with those of other states, is 22 km from the coastline, and so the space over these areas is subject to Somalia’s national sovereignty, but not the space over international water. So what happens if unauthorised airplanes enter Somalia’s airspace? The answer to that question is complicated. In the early years of the aviation industry’s development, the protection of states’ national security was one of the major reasons for the establishment of complete and exclusive sovereignty over airspace. In the last century, a number of aircrafts have been shot down because they were considered as a threat to national security of sovereign states when they entered other states’ airspace without authorisation. One example of this measure is the shooting down of the South Korean aircraft in the airspace of the former USSR on 1st September 1983. The aircraft B747-200, which departed from J. F. Kennedy Airport in New York, United States with destination of Seoul, South Korea, was shot down by a Soviet Union Fighter jet as the aircraft drifted from its original route and mistakenly entered the airspace of the former Soviet Union. The shooting was unnecessary, as the plane was clearly visible and recognisable as a civilian aircraft, though the USSR argued that it was protecting its national security from a potential threat. The UN has reported that, in 2011 alone 64 foreign fighter jets, helicopters, and drones were operating in the Somalia`s airspace (without permission from Somali government), and most violations were committed by the US and neighbouring countries. So, is Somalia entitled to shoot down any unauthorised aircraft that violates its sovereignty? Indeed, as any country has the right to do so. However, is Somalia able militarily to take such action at the moment? I doubt it, though the country can make complaints to the United Nations (UN).